I have had very little time to knit this fall. 3 practices a week, and 2 games on weekends, sometimes with considerable travel time. But the college season is over now. 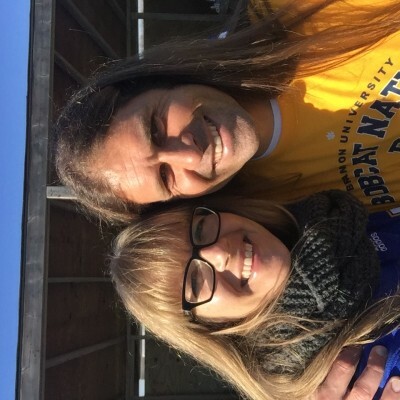 We made it to the finals this weekend. As coaches, this was our goal for the season. We’re a new team, just two years old, and last year we made the semi-finals. We were leading 1:0 at half, but ended up losing 1:2. Incredibly proud of the team, the effort, the skill. I’ve been knitting here and there, but nowhere near the prolific fall production I used to manage. 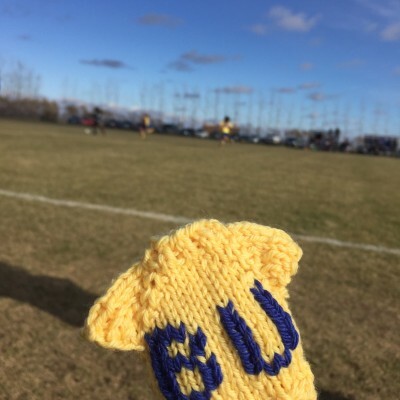 The nearest I got to knitting this weekend was to hold this up on the sidelines during the first half. 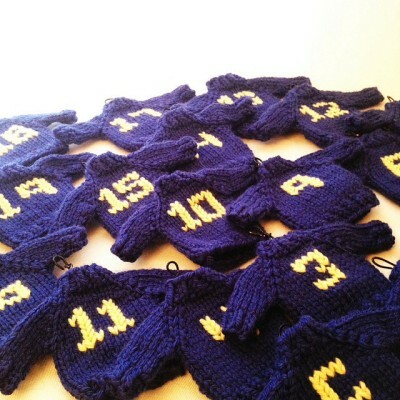 I’ve done 14 of these 24 mini jerseys I’ll be making to give to the girls and other coaches. Last year I did full sweaters in blue with gold duplicate stitching. I want each year to be a bit different, so I reversed the colours this time and went with short sleeves. I’ve been fiddling with the numbers and the process until there’s not much the same about them at all. I found a few clever tricks that mean the sleeves are self-finishing and so there are only 2 ends to weave in at the finish. I can finish one in less than an hour. Which is good, because, as I mentioned, I haven’t had much knitting time lately! Do you knit multiples of things? Know any addictive wee patterns? I knit a few mini sweaters every year, and I have found mini hippopotomi reproduce like crazy in my house.